The Old Town School and its Music Moves Chicago program proudly present Quantum Englewood: A Journey Through 100 Years of South Side Musical History, a 90-minute piece commissioned by the Old Town School and written by renowned Chicago artists Ernest Dawkins and Rahul Sharma, featuring hundreds of Chicago musicians and vocalists gathered on stage, culminating a two year-long learning process. Quantum Englewood seeks to uncover the unheralded traditions behind contemporary urban music and instruct an intergenerational corps of musicians in these roots and genres. Among the talents to be featured: Live the Spirit Jazz Ensemble and FUNKADESI, joined by the Soul Children Gospel Choir, Ben LaMar, Phenom & Poetree, Inc., Fernando Jones' Blues Kids, Paul Cotton, Maggie Brown, Foli Dambe, Amyna Love, The Bucket Boys, Idy Ciss, the Emcee Skool, the Lindblom A Capella Choir, the Artemis Singers, and Brother El, plus Music Moves students and community members from Real Men Charities, Let Your Rhymes Inspire Creativity (LYRIC), and I Grow Chicago, plus Michael Miles & the Old Town School Fiddlers, and more! 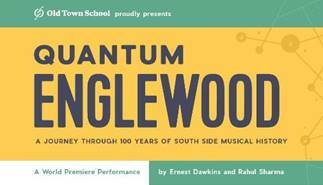 Quantum Englewood will have its World Premiere in one performance only, at Lindblom Academy Auditorium, 6130 South Wolcott Avenue, Saturday evening, September 15, at 8 p.m. This family-friendly performance is free and open to the public; advance reservations are recommended by visiting ots.fm/quantum. Quantum Englewood is presented by Old Town School's 'Music Moves Chicago' program - an extended partnership with public health, social service and community development agencies in the Englewood neighborhood, explicitly using engagement in arts participation to achieve positive results for youth and their communities. The piece gathers together a range of Chicago's many youth-centered musical institutions, non-profit arts organizations, community choirs and faith-based groups, in a celebration of their common musical history. Quantum Englewood's student performers rehearsed their parts in their individual locations, coming together for large rehearsals and performances at the end of the process. "The richest history of music in Chicago in the last century had its roots on the South Side. In fact, it is the origination point of almost all of the musical traditions that Chicago is most known for: Blues, Gospel, Hip Hop and Jazz," said Bau Graves, Old Town School executive director. "A rich diaspora of world music, particularly from West Africa and the Caribbean, all found its first Chicago home on the South Side, and all of this will be gloriously represented in Quantum Englewood by a multigenerational cast of hundreds."